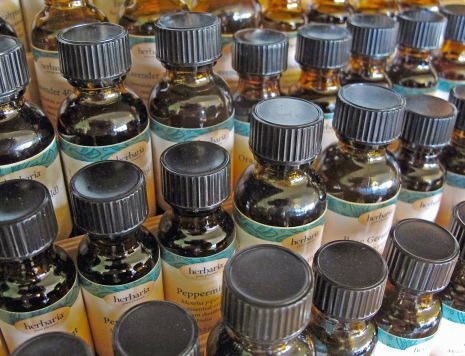 Because you’ve asked, we sell 51 of the same pure essential oils we use to scent our soaps and other products. Select yours from the drop-down list. You'll find a complete list at the bottom of this page as well. See our recommendations for use and warnings below. Over the past dozen years, we have established reliable suppliers of quality oils from all over the world. Because we purchase in bulk, we can offer you smaller quantities at a good price. We offer our essential oils in .5-ounce and 1-ounce amber glass bottles with screw caps. Our essential oils are steam distilled with the exception of these cold-pressed oils: bergamot, lemon, orange, pink grapefruit, and tangerine. We offer two essential oil mixtures, Biotherapy Blend and Marseilles Blend. Biotherapy Blend is the mix we use in our Biotherapy soaps. It contains tea tree, palmarosa, lavender, geranium, patchouli, and vetiver. The Marseilles Blend is named after the famous formula of plant essences used to protect people from the plague in the Middle Ages. Many have asked us for this equivalent of Young Living Four Thieves® Oil. It contains clove, lemon, cinnamon, eucalyptus, and rosemary. Our essential oils are for external use only, not for consumption. Some essential oils are to be avoided during pregnancy. Warning lists vary as to what oils to avoid. The concentration of essential oils in any product makes a difference. Using a bar of our soap, for instance, is not the same as putting essential oils directly on the skin. Consult your healthcare provider. Keep essential oils out of eyes, ears, nose, mouth, and any opening of the body. Keep out of reach and do not use on babies, children, or pets. Before using any essential oil, dilute a small amount with a carrier oil, such as olive oil, and patch-test it on your inner arm. Do not use if redness or irritation occurs. If you have sensitive skin or any serious medical condition, do not use essential oils unless you consult with your doctor. Essential oils are flammable. Do not store around flame, heat, and ignition sources. Essential oils will break down most plastics. When we bottle products in plastic, we use HDPE plastic, considered safe to use with essential oils. Essential oils dissolve rubber, such as the squeeze bulb on our droppers. Bottles with droppers should be stored upright. Our Essential Oil Starter Kit contains our 6 most popular essential oils in 10ml (.34oz) bottles. Watch this two-minute video about essential oils and you’ll appreciate why we never put “fragrance” in our products. Product price changes based on your selection. ATTENTION: Essential oils dissolve rubber, such as the squeeze bulb on these droppers. Bottles with droppers should be stored upright.